I’ve been doing a little soul-searching and I realize it’s time to get serious. At least, a little more serious. While I am at a good place with my running, I have been a major slacker in the cross training department. It’s not a good thing. I mean, I have the Jillian Michaels’ Power Yoga DVD and I try to do it on a regular basis, but I don’t. And while I hate (hate hate HATE) the idea of going to a gym to sweat and struggle in front of an instructor and a group of people, I think that’s what I need. So I did some research and I found a gym set up rather close to home. They offer a small selection of classes, including bootcamp and spinning, and you can pay by the class without having a contract. The only con is that they don’t have classes during the day, which is when I will have extra time with little man going off to Kindergarden, but I’m no stranger to getting up at the crack of dawn. Now, I just have to make the call and get set up. I have given myself a deadline of Thursday to get it done. You see, I also hate making phone calls so I have to give myself some time to work myself up to it. Hopefully, I’ll be set up to start my first class by next week. The second thing is that I think it’s time to switch up my capris. I have been running in compression capris and I really like them, but I can’t deny the fact that it’s hot. I mean, it’s August in Florida and no matter how early or late I run, the humidity is suffocating and the temperatures are high. We still have a few more months of this weather, and I think it’s time to incorporate a running skirt into my fitness wardrobe. This is a huge step for me. I pretty much never wear shorts and the runningskirts are a wee bit on the short side (I’m more of a maxi dress kind of girl). I found a couple that I like, and I even went to Lululemon to go so far as to try one on to see how it looked. I am right between sizes or I probably would have walked out with a Pace Setter. And there we have it. Two things I’m doing that will be huge leaps outside my comfort zone. It’s going to be a huge week! What have you done lately that made you step outside your personal comfort box? Which skirt would you pick? I hate making phone calls too!! It’s something that has stayed with me since I was a child. Those skirts are so cute!! I would take up running just so I could wear one. They look pretty similar so I would have to try them on to choose! FitBritt@MyOwnBalance recently posted…Greetings from Cape Cod! Well, I did it! I called up and got the details and am going to start next week. Eek! I can’t try on the two Athleta ones – we don’t have a store around here. I think I’m just going to play Eenie Meenie Miney Mo and hope for the best. You are going to feels worlds better the moment you swap your capris for the skirt, in the fl heat, I promise you’ll never go back! Yey for joining a gym! I am much the same, I never ever would spend a whole hour doing strength if it weren’t for body pump! I’m so scared!!!!!!! And vain. Incredibly vain. Showing that much leg freaks me right out. I hope that the gym goes well. This is definitely going to be something new. Sarah @ Sweet Miles recently posted…What’s In A Name? I’m starting next week for sure. There will be stories to tell. I loved the Lulu skirt, too. However, I need to either drop five or gain five pounds for it one of the sizes to fit me properly and I don’t want to drop that kind of money for something that was only meh in the dressing room. Phone calls are clearly the worst. I got it done, though, ahead of time! Crosstraining will definitely be good for me. NOt something I’m really excited about, per se, but excited about how it will improve me as an athlete. It’s just too hot to keep going as I am. I’ll report back on what I decide. I tried on a pair of shorts. It was a no go. The world just isn’t ready for that level of horror. Stepping out of your comfort zone is scary, but definitely worth it! You should try doing some circuit training at home. I have a one year old and find it so convenient and you definitely get results! I love the cuteness skort! I joined a gym for cross training. I spin twice a week and feel it gives my legs a break. Do you like the spinning? I’m not sure if I’m going to enjoy it. But I guess you just don’t know til you try. I don’t love how short they are, but I don’t think you can run in long skirts. At least not super effectively. I do really like spinning. Next to running it is my favorite workout. However, a lot depends on the instructor so if you get a bad one the first time try it out again with a different person. I’ve never run in a skirt, I just haven’t found one that i like, but i do like that lulumon one. Just remember the magic happens outside your comfort zone. I love those skirts! I am actually super excited for fall so I can start wearing capris and leggings while running again. And good for you for taking that next “serious” step and figuring out a gym to workout at! Kristen @ Medium Roast recently posted…The Pleasure of Good Posture. Capris are really my favorite. They haven’t been bothering me until recently, but now it’s getting to be too much. Hmmmm, they are all adorable, but I think I like the Athleta Swagger Skort best. What is it about making phone calls? I hate doing that, too! Good luck! Debbie @ DebRuns recently posted…Becoming a Runner, Where Should You Start? I have no idea what it is, but man, I hate the phone. My comfort zone is all running and not much else, so I totally get what you mean! Good luck w/ your new activities! The skirts are all cute. I love the new ones w/ the ruffles/pleats. So much better than the flat style. Great tip about the pockets. I think if and when I ever get to 16-18 miles then I might need to reevaluate but for now, I think the cross training will serve to make me stronger and build some muscle. Or at least, that’s the rumor. If not, I can always stop. The most helpful crosstraining personally has been High Intensity Interval Training/Tabata and Core exercises I can feel improvements in my running form from core alone. If you have the time its great! Glad to stumble on your blog and looking forward to following along! I wear running skirts almost exclusively (unless it’s cold out) but I’m typically a Nike girl, because the stuff just fits me best. 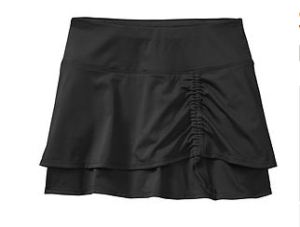 I am about to pull the trigger on a skirt from Skirt Sports, I think – I love their stuff. Cross training is one of my struggles. I’m just soo lazy. I cant’ do it! As for skirts. For some reason, I just can’t imagine exercising in skirts (although I grew up cheerleading so not sure why). For our first Disney 5k, I had to convince my friend to run it with me. So when we got to the expo and she begged me to try a running skirt, I agreed since I owed her. And I haven’t looked back. I LOVE running in skirts! I love the pace setter! And I’ve been eyeing the swagger for a while. The cuteness one is new…I’ll have to check it out! I have the swagger skort in purple and I love it. My only complaint is that the waistband sits pretty high, and I don’t have a short torso. I have a few others, the one I love the most is from UA. I have one or two from Brooks that are nice as well. The most important thing I’ve found is to make sure the shorts underneath don’t ride up while you run.